John sadly passed away in Cape Town after a major joint operation. He was born in Cape Town on 27 March 1935. His father was a respected, true family GP in Sea Point, fondly remembered by former patients, including Stuart Saunders, former UCT Vice-Chancellor. John's friends remember his mother's charming hospitality. John adored her and visited her frequently from the USA. John excelled at St George's Grammar School, where he was head boy. He was an outstanding scholar and sportsman. He represented UCT in the 1st 15, and in the UK he played in the Combined London Hospitals rugby teams. I (JT) met John on the first day of 'Fresher's week' at UCT in 1953. We remained special close friends thereafter, despite spending much of our professional lives on different continents. John loved and would do anything for his friends and had an enviable and very personal way of making and retaining close friendships. John never said a harsh word about anybody. He was so much larger than life, which he lived to the full. We retain the varied, cherished and wonderful memories of fun times we had with this very special person. Many will remember the glint in his eye when he was about to lead us into scrapes. John was full of humour and great fun to be with. 'Girls' were a special part of his life. When young, he charmed not only the girl he fancied, but also her parents, especially her mother! He was briefly married in his early years in the UK and more recently very happily married to his beloved Noreen. Many messages from around the world from friends (former co-students and colleagues) include those from Brian Kennelly from California, Robin Macdonald in the USA, Jill Key from Durban, Mick Leary from Bristol, and David Paton from Norfolk. They spoke of a character who will be sorely missed by all who knew and loved him and of fond memories of their days at Medical Residence - not all repeatable! Ralph Vaughan, prominent in the anaesthesia community, recalls John with great respect for his clinical skills and with affection for the escapades on rugby tours, echoing that 'glint in the eye' when embarking on an evening's fun. Noreen Viljoen's son, Jon O'Brien's, on behalf of his brothers Keith and Denis, from the USA, thanked those who honoured and paid tribute to John. He noted that he was a talented anaesthesiologist and a loving man who openly welcomed them when he married their mother. John provided sound advice and brought them down to earth when their ideas got too wild. His counsel and companionship were inspiring and will truly be missed. 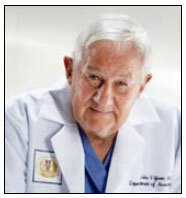 John was an outstanding doctor and an internationally recognised anaesthetist. He did his internship at Groote Schuur Hospital, and trained in anaesthetics in London. Following a Graduate Fellowship at the famous Cleveland Clinic in the USA in 1966, he was appointed to their staff and became director of cardiac anaesthesia in 1968 and Chairman of Anaesthetics from 1973 to 1976. He moved to Los Angeles, firstly as Chief of Anaesthetics at the VA Department linked to the University of California, LA. He was recruited to the University of Southern California as Professor and Chairman of Anaesthetics in 1981, an appointment which he held until he retired in 1993. He was the first incumbent of the second chair of Anaesthetics at UCT, which he held until his final retirement in 2000. He was internationally recognised for pioneering work on anaesthesia in coronary bypass surgery at the Cleveland Clinic. His other interest was chronic pain management. He had over 50 peer-reviewed publications and was an invited visiting professor to most major countries in the world. At UCT he contributed to all aspects of departmental life, including the administrative expertise from his experiences in the USA and valuable ideas for departmental research. He developed several innovative devices, particularly in thoracic anaesthesia. He was a valued teacher, bringing his wealth of expertise in cardiac anaesthesia into our clinical arena. When the Pain Clinic had a staffing crisis he willingly maintained this important clinical service for many years. On retiring officially, he maintained a keen interest in the Department via sessions and locums. When no longer clinically involved, he regularly participated in the departmental grand rounds, contributing valuable insights. His friendship and good humour remain the abiding memory of his immense contributions. Farewell special friend. Dear John, we will all miss you.